← High fiscal deficit discourages new investments in Bolivia! 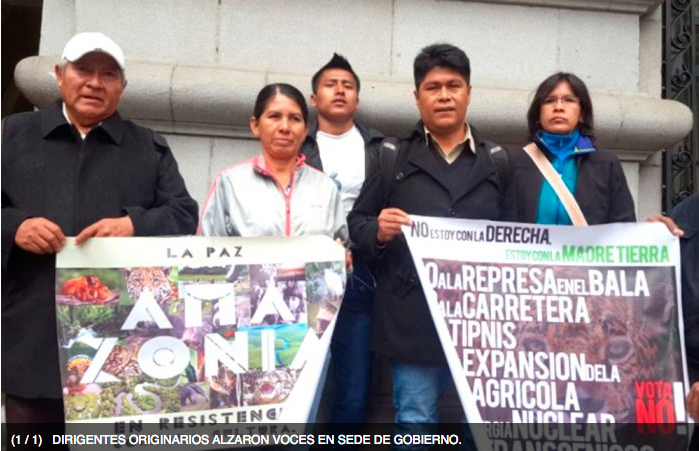 Bolivian indigenous people confirm rejection of dams! By the end of the 20th century, in separate studies, both the World Bank and USAID came to the conclusion that dams were not viable over the long run, that their consequences would be more damaging to the overall environment. Now, we see that many countries around the world are looking at ways to mitigate that damage, while here, the ochlocratic government of the coca caudillo is pushing relentlessly to those dams that will seriously damage the Madidi Park, which is considered a hot spot in biodiversity terms. The excuse is the electricity that they claim will be sold to Brazil … another ridiculous wish dream, as the distance is so far away that energy would be lost in greater quantities to make this venture worthwhile. The masismo also built an urea plant in coca-country, so far away from a real market and with that much humidity in the Chapare, is also not viable. In short, this government knows nothing about sustainable development. All their state-owned enterprises are in the verge of bankruptcy and are by any means not competitive! evo has lied repeatedly about caring mother nature and indigenous rights, with these dams, he is certainly affecting the lives of the Bolivian Amazon people. This sorry excuse of a government has wasted money in the sugar mill at San Buenaventura and there is not enough sugar cane, let alone quality, to produce sugar. Thus damaging the environment. On the International Day of Action against megadams and in Defense of the Rivers, water and life, representatives of the indigenous communities of the Amazon rejected the construction of the Chepete-Bala hydroelectric megaproject because they constituted a threat to the environment and the life of the villages. The Government said to have “conviction” of its viability. At the end of the Cabinet meeting, the Minister of Energy, Rafael Alarcón, said that the Government would not be working on the final design of the mega-company Chepete-Bala if it would not have the “full conviction” of its viability. “We have never denied environmental impacts (…). The design is delayed because we have made observations to the document delivered by the consultant,” he said. Representatives of the Commonwealth of Indigenous Communities of the Beni, Tuichi and Quiquibey-Chepete Bala and Rositas rivers mobilized at the doors of the Palace to protest against the megadams as they considered them as harmful to the environment and the very life of the indigenous peoples they will displace of their territories condemning them to their disappearance. This entry was posted in Beni, Bolivia, Energy, Environment, La Paz, Politics, Social Unrest and tagged bad politics, demagogue, environmental damage, government failures, indigenous rights, Ochlocracy. Bookmark the permalink.